Your little unicorn lovers will go crazy over this FREE printable learning pack designed especially for toddlers, preschoolers and kindergartners to practice early math & literacy skills. Alphabet and number recognition, counting, letter sounds, size, letter cases, handwriting, scissor skills, puzzles, coloring pages and more! 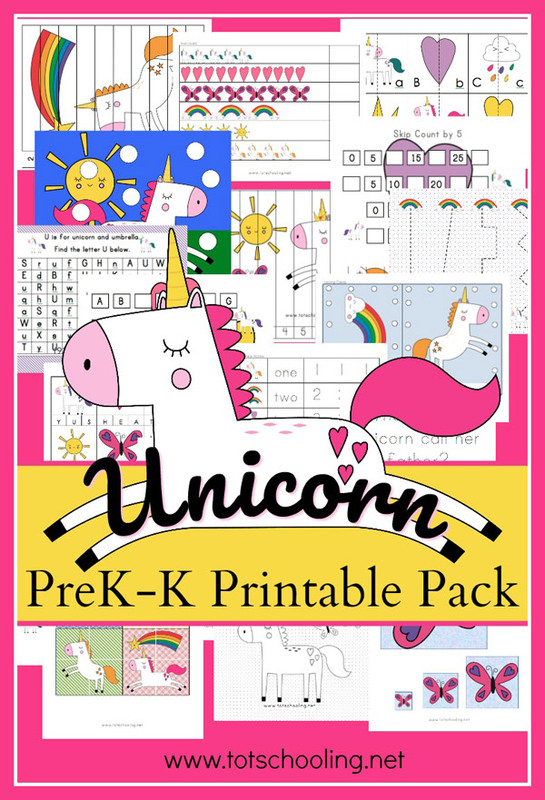 This Unicorn Printable Pack is FREE for all Totschooling subscribers! -You will receive access to free printables that are not available for download on the website. This includes holiday and seasonal packs, as well as other themed activity packs. -You will get access to a collection of Board Book Printable Activities and Nursery Rhymes sequencing. -After confirming your email address, you will receive a Welcome Email which provides the link to the subscriber's page. This subscriber's page is where you can download the Unicorn Pack as well as ALL other subscriber freebies. -Please check your email thoroughly for this email including spam folder, promotions folders, etc. If you still do not see it, please email me at [email protected] and I will be happy to send you the link.